Donkey skins and elephant hides hang limp on wardrobe hooks; the pigs that wore them subdivide their spoils and cook the books. All the political world's a stage and all its pigs are players; while treading on the boards they wage their plays like dragon slayers. But when the final curtain's dropped until their next performance, each pig gets swilled and then gets slopped after each pig's 'misinform' dance. What better life is there than this, than political artifice? Pig heroes, cheer; pig villains, hiss; When costumed, pork seems not amiss. Donkey skins and elephant hides hang void on wardrobe hooks; after each performance's ride, the pigs are not the schnooks. Who bought the tickets, saw the show, and thought all was quite real? The easy mark, the sucker and the schmo think that none of their pigs would steal. The public cheers and claps and fawns, each one a stage door Johnny; but to the script they are but pawns, for piggly heroes brawny. Donkey skins and elephant hides await our Thespian pigs; tomorrow's show -- I laughed, I cried -- with make-up, costumes, wigs. Let's cheer the play that's quite well lit, well costumed and well played, and think the show is real grit, and not a pig charade. Donkey skins and elephant hides, when filled by piggy players, look not so much like pork inside, but real dragon slayers. And yet when end their passions' plays, stripped of costumed roles, they were pigs always. Addendum of Enron-type Accounting: " 'Successive Congresses, whether dominated by Republicans or Democrats, have spent the postwar accumulating massive net fiscal obligations, virtually all of which have been kept off the books,' he noted. 'Congress' economically arbitrary decisions as to what to put on and what to keep off the books have not been innocent,' he continued, criticizing what he called 'the Enron-type accounting that’s been going on for decades under both parties'." In "Economist Tells Congress: U.S. May Be in 'Worse Fiscal Shape' Than Greece," by Barbara Hollingsworth, Cybercast News, 9 March 2015. 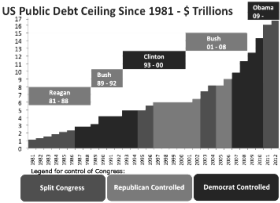 As political parties have supposedly changed power positions in succeeding elections, one may note the downturn in public debt and therefore the difference between the parties -- or perhaps one might notice no downturn but rather the rising curve and decide the parties are only separated by degree of growing indebtedness. You decide, from the verifiable data below. Copyright © 2009, 2013 Gary Bachlund All international rights reserved.